I get to go to church quite a bit. More often than I care to admit, some bloke gets up and reads bits of Bible. Sometimes I nod off because…..
Way back then when they were first doing Bibles, they wrote it in the language the ordinary people spoke. So, for example, when the story of Jesus was getting written up, it was in your ordinary everyday language of your ordinary everyday person. So why don’t we have the same in Godzone today? Well now we do. 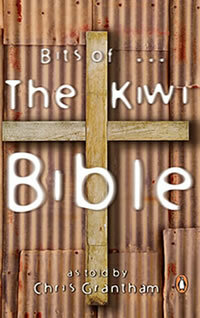 The Kiwi Bible. This book covers Jesus’ life plus a bit more. If Kiwis like it (and show that by buying it!) then me mates at Penguin (the publishers) might well be tempted to do a sequel (or a prequel, they seem to be more common these days eh!) The prequel will include stuff about the beginnings of things, and some of the good, bad and ugly types from way, way back. Even some good old poems. Watch for it.